(Bloomberg) — Commodities will wrap up a monthly gain this week, but it’s been a bumpy ride and more turbulence is likely as investors track trade tensions and companies’ earnings. Aluminum remains in focus almost a month after the U.S. introduced sanctions against United Co. Rusal, then eased off. To open the week, we’ve numbers from Arconic Inc.; Tuesday sees the deadline for U.S. metals duties to kick in, or be extended; and on Wednesday, there’s likely be substantive remarks from powerhouse Glencore Plc at its AGM. Gains in crude have buttressed April’s advance in raw materials, and this week will see a slew of data that’ll help investors to get a sense of whether the rally has further to run. Also critical to the outlook will be earnings from a host of major U.S. shale producers, including Pioneer Natural Resources Co. Elsewhere, agricultural behemoths Archer-Daniels-Midland Co. and Bunge Ltd. report their performance. Last, China’s opening up a little bit more, this time in iron ore.
With the fallout from U.S. sanctions against United Co. Rusal continuing to reverberate through the aluminum market, one key question for investors is how quickly the Russian company can restart shipments now that the Treasury Department has extended a grace period to allow customers to wind down contracts. 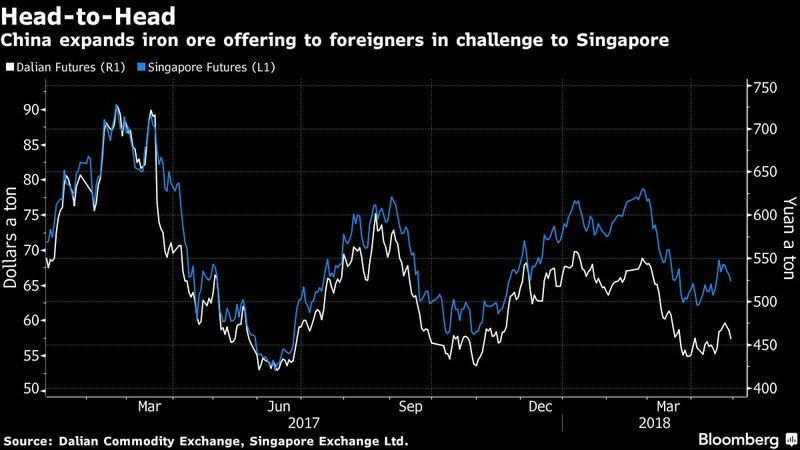 Traders are willing to take supplies of metal from the world’s second-largest producer, but so far the process hasn’t been smooth. Any further delays are likely to reawaken concerns about the industry’s heavy reliance on the company, even as sanctioned billionaire Oleg Deripaska’s decision last week to reduce his stake in the holding company through which he controls Rusal may ease some of the pressures. Investors will also scrutinize commentary from U.S. manufacturer Arconic Inc., which reports on Monday, as well as any insights from senior executives at Glencore Plc, when the commodity powerhouse hosts an annual general meeting in Zug on Wednesday. The global energy market will look for further clues this week on how oil producers are complying with an OPEC-led pact backed by Russia to limit output, with their concerted push countering rising supplies from U.S. shale fields. To that end, a slew of tanker trackers and analyses of OPEC supplies will begin to emerge at the start of May, which begins on Tuesday. Russian government data will also be released on Wednesday, including how much the nation has been pumping. Brent crude has advanced more than 40 percent over the past 12 months into the mid-$70s a barrel, and the figures will help investors determine how much further the rally may go. Shale producers including Anadarko Petroleum Corp., Devon Energy Corp. and Pioneer Natural Resources report earnings this week. In an industry grappling with shortages in labor, equipment and pipeline capacity, investors will be looking at companies’ plans to mitigate their situation, according to RBC Capital Markets. Profit margins have already been squeezed as producers were forced take lower prices for their barrels, amid logistical hurdles. The results will also show which exploration and production companies are heeding calls to restrain spending and return more cash to shareholders. “Investors will look to gauge which E&Ps will hold the line on their budgets, said Charles Robertson, a Cowen & Co. analyst in New York. Marathon Oil Corp., Noble Energy Inc. and Apache Corp. are also due to report this week. In the agricultural markets, attention this week will focus on Archer-Daniels-Midland Co. and Bunge Ltd., two of the largest trading and processing companies, as they report first-quarter earnings on Tuesday and Wednesday respectively. There will be interest in what they have to say about consolidation, after people familiar with the matter said last week that advanced merger talks between the pair ended without an agreement. ADM wasn’t able to circumvent potential antitrust issues, the people said. ADM and Bunge are major players in soybean processing and the two companies likely benefited as crushing margins surged. Argentina, the world’s biggest exporter of soybean-meal, has suffered from a prolonged drought, hurting its harvest outlook and improving prospects for U.S. crushers. Barely a month after China introduced crude futures with a product overseas investors may trade, the authorities are taking another step to globalize the nation’s commodity markets. Yuan-denominated iron ore futures on the Dalian Commodity Exchange will be opened up to foreign players from Friday. China is the top destination for seaborne ore, drawing in over 1 billion tons a year, and futures in the raw material attract massive domestic interest. The more accessible Dalian product will alter the competitive landscape for Singapore Exchange Ltd., which offers popular dollar-priced contracts. The dryness in Brazil that’s seen causing irreversible damage to the corn crop in the world’s second-largest exporter, is spurring a bullish outlook. More than 80 percent of traders and analysts surveyed by Bloomberg expect prices to gain, the most in data going back 2015. Wheat bulls also outnumber bears, according to the survey. In the European natural gas market, negative sentiment prevails as storage refills accelerate. Terminal subscribers can see the commodity surveys here.